Use the mouse to aim your weapon, fire using the left click button. The mini map can be found at the top right of the game screen. 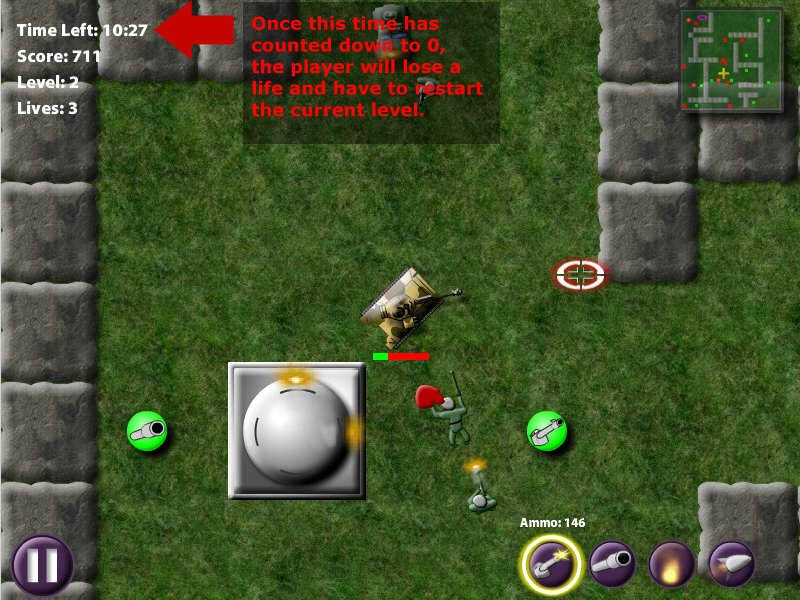 It shows the player where the enemies, walls, ammo, exit and player are located on the current level. The level exit is a purple oval ring. The player appears as a gold '+' sign. At the top left of the game screen there are several game stats including score, level, and player lives left. At the top of these stats is 'Time Left'. This is the amount of time the player has to reach the exit. The total amount of time a player has to complete the level varies per level. At the bottom right of the game screen are the weapon buttons. From left to right, machine guns, cannon, flame thrower, rocket launcher. When you left click on one of these buttons, it activates the weapon and displays the amount of ammo that weapon has left. When you fire your weapon, the button will temporarily turn gray, and can not be fired again until the button is once again completely purple. This is because different weapons have different firing rates. Cannons can not fire as quickly as machine guns, so the button remains partially gray longer when a player fires a cannon than when he fires a machine gun bullet. When the weapon is out of ammo, the button turns gray and will not change until the player picks up more ammo for that weapon. A player can also change weapons by hitting the SPACE BAR on his keyboard. This will cycle through the weapons from left to right. The player may also right click to bring up a small menu with the available weapons he can switch to. When a new weapon is activated, it will be marked by a yellow glow around the button, and the text above it will display the amount of ammo remaining for that weapon.